Master storyteller and bestselling author Steven Pressfield returns with a stunning, chillingly plausible near-future thriller about the rise of a privately financed and global military industrial complex. The year is 2032. The third Iran-Iraq war is over; the 11/11 dirty bomb attack on the port of Long Beach, California is receding into memory; Saudi Arabia has recently quelled a coup; Russians and Turks are clashing in the Caspian Basin; Iranian armored units, supported by the satellite and drone power of their Chinese allies, have emerged from their enclaves in Tehran and are sweeping south attempting to recapture the resource rich territory stolen from them, in their view, by Lukoil, BP, and ExxonMobil and their privately-funded armies. Everywhere, military force is for hire. Oil companies, multi-national corporations and banks employ powerful, cutting-edge mercenary armies to control global chaos and protect their riches. Even nation states enlist mercenary forces to suppress internal insurrections, hunt terrorists, and do the black bag jobs necessary to maintain the new New World Order. Force Insertion is the world's merc monopoly. Its leader is the disgraced former United States Marine General James Salter, stripped of his command by the president for nuclear saber-rattling with the Chinese and banished to the Far East. A grandmaster military and political strategist, Salter plans to take vengeance on those responsible for his exile and then come home...as Commander in Chief. The only man who can stop him is Gilbert "Gent" Gentilhomme, Salter's most loyal foot soldier, who launches a desperate mission to take out his mentor and save the United States from self destruction. Infused with a staggering breadth of research in military tactics and steeped in the timeless themes of the honor and valor of men at war that distinguish all of Pressfield’s fiction, The Profession is that rare novel that informs and challenges the reader almost as much as it entertains. Steven Pressfield is the author of several books, including the bestselling novels Gates of Fire and The Legend of Bagger Vance, as well as the cult classic on creativity The War of Art. He lives in Los Angeles. 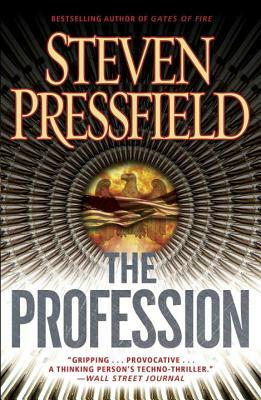 "Steven Pressfield, in "The Profession", has written a novel of the near future that is as good and in some cases better than anything Tom Clancy ever wrote in his day." "When I read a novel, I want to go someplace, with somebody who's been there. In THE PROFESSION, Pressfield takes us into the heart of combat—and even deeper than heat of the action: he takes us into the soul of the warrior. This is all the more remarkable because the world he leads us into hasn't happened yet—though we see its possibilities, its unfolding reality, all around us. To give us this book, Pressfield went to the places were soldiers and ideologies are colliding, and he sifted the thoughts, motives and skills of the men at the cutting edge of those conflicts. But best of all, for me, is that he seems to have looked into my heart too." "Pressfield's impressive research shows throughout this novel.... a book that paints an all-too-plausible future in which American outsources its dirtiest jobs."